The Himba, Tjimba and other Herero people who inhabit Namibia’s remote north-western Kunene Region are loosely referred to as the Kaokovelders. Herero in terms of origin, language and culture, they are semi-nomadic pastoralists who tend to trek from one watering place to another. They seldom leave their home areas and maintain, even in their dress, a tradition of their own, on which other cultures have made little impression. For many centuries they have lived a relatively isolated existence and were not involved in the long struggle for pasturelands between the Nama and the Herero to any noteworthy extent. The largest group of Kaokovelders is the Himba, semi-nomads who live in scattered settlements throughout the Kunene Region. Tall, slender and statuesque, they are characterised especially by their proud yet friendly bearing. The women especially are noted for their unusual sculptural beauty, enhanced by intricate hairstyles and traditional adornments. The homes of the Himba are simple, cone-shaped structures of saplings, bound together with palm leaves, and plastered with mud and dung. The men build the structures, while the women mix the clay and do the plastering. A fire burns in the headman’s hut day and night, to keep away insects and provide light and heat. A family may move from one home to another several times a year to seek grazing for their goats and cattle. Men, women and children wear body adornments made from iron and shell beads. 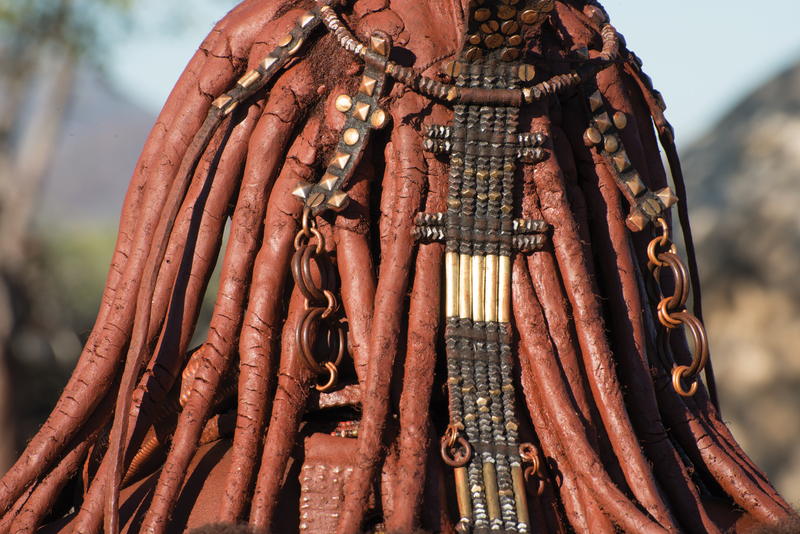 In the Himba culture, ornamentation of the head and hair traditionally featured prominently, and in many parts of Kaokoland still does. A young girl typically has plaits (ozondato). Once she has completed her puberty ceremony, she wears the ekori headdress made from tanned sheep’s hide or goatskin with three leaf-shaped points, often decorated with iron beads. Himba males also wear different hairstyles, such as the single plait, the ondato, worn by young boys down the back of the head; the two plaits, ozondato, worn by Himba men of marriageable age; and the ombwiya head-dress, a scarf made from fabric covering the hair and decorated with an ornamental band. A Himba woman spends as much as three hours a day on her toilette. First she bathes, then she anoints herself with her own individually prepared mixture of butter fat, herbs and ochre. This mixture not only protects her skin from the harsh desert sun, but also keeps insects away and prevents her body hair from falling out. She uses another mixture of butterfat, fresh herbs and black coals to rub on her hair, and ‘steams’ her clothes regularly over the permanent fire. Virtually all tour operators to this remote region take their guests to Himba settlements to meet these extraordinarily resilient and physically beautiful people who have retained so much of their traditional culture. In Kaokoland Himba women make unusual, finely woven baskets with beautiful sculptural shapes. Traditionally they used these baskets to store milk or fat, and in many areas still do. Shapes vary from a bottle with a neck and narrow mouth to a deep pail. Most have a leather handle with iron-beaded decoration so that they can be hung in the ondjowo (dwelling). Bowl-shaped baskets are also made and used for winnowing the grass seeds collected from ants’ nests. Some years ago locals in the north-western Kunene Region started harvesting the golden resin that falls from the resilient omumbiri tree (Commiphora wildii), resulting in the initiation of the Commiphora wildii Resin Project. The resin, used traditionally by Himba women as a perfume, is harvested and exported to Europe, where it is used in the preparation of primarily French perfumes. The Hizetjitwa Indigenous Peoples Organisation (HIPO) introduced its first two-day cultural festival in August 2011. Consisting of traditional performances by the Himba, Zemba, Tjimba and Twa tribes, it was held in an open area on the outskirts of Opuwo in the Kunene Region. There are about 2 000 HIPO members from 85 registered villages in the region. HIPO is an organisation that works towards helping indigenous people in Namibia and Angola to retain their culture and values, meet the challenges of contemporary society and improve their living conditions. The festival is an annual event. For those visiting Purros along the Hoarusib River, the Marienfluss, the Hartmann Valley surroundings, Opuwo, and Epupa Falls via Sesfontein, there are several community campsites in the area. Perched on a hill surrounded by mountains with a river running below, the Khowarib Campsite, 33 km south of Sesfontein, is a well-positioned and attractive community facility consisting of four private sites. Each has a lapa area with a basin (and tap) and a railway-sleeper counter top. Guided visits to the Anmire Traditional Damara Village and the Bushman paintings are offered. If you’re well prepared and set on travelling the difficult terrain of Van Zyl’s Pass into the Marienfluss, then Van Zyl’s Pass Campsite provides a good stopover. The camp is situated 20 km before the pass, near the village of Otjihende. Take note that this route should only be undertaken by those experienced in four-wheel driving. At the Epupa Falls Campsite, spread out under makalani palms, water rushes toward the falls and fine mist sprays into the air. The campsite is within walking distance from the falls. The Kanamub Mountain Camp, 24 km from Sesfontein en route to Purros, is positioned against a mountain between huge granite-gneiss boulders with a spectacular view of the surrounding countryside. It is situated under a large rocky overhang, with a tap, kitchen counter and shower built into a boulder alcove of rock walls, and a donkey boiler providing hot water. For those driving on to Purros, a four-wheel drive vehicle is necessary for the sandy roads. The Puros Campsite is positioned on the banks of the Hoarusib River, home to the desert-adapted elephants, which often wander through the campsite. Six sites are positioned under large camel-thorn trees, each with its own private ablution block with hot water and flush toilets. 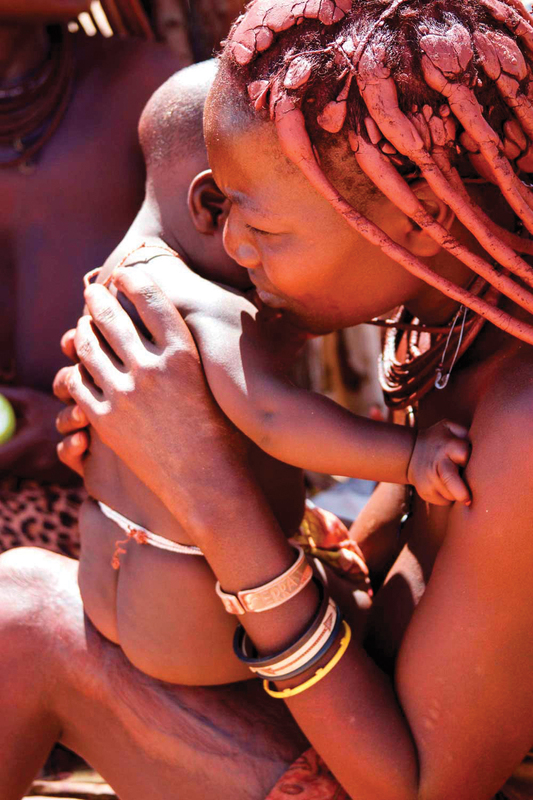 Guided trips to a nearby Himba demonstration village and the surrounding areas are offered. Close to Puros Campsite is the Puros Bush Lodge, which offers accommodation to travellers who do not want to camp. This is a self-catering lodge with en-suite accommodation in six twin-bedded rooms. A family room with twin beds and a bunk bed is also available. At the Puros Traditional Village striking Himba women of varying ages dressed in traditional attire and covered in red ochre are willing to show you the various Himba rituals, offering snippets of interesting Himba information and intriguing demonstrations. A shop stocked with Himba crafts sells Himba jewellery, makalani palm kernels carved into key rings, baskets, beadwork and bracelets. Situated approximately 200 km from Opuwo, the Marble Campsite is an attractive and well-equipped facility that is a veritable oasis on the rough roads of the area. Its five sites all have their own kitchen counter and barbecue area, and share a stylish communal ablution block made of local stone and thatch. Two hiking trails routed around the camp and a visit to a Himba village offer alternatives to resting and relaxing. A joint venture between the Orumpembe Conservancy and local entrepreneur and artist, Trevor Nott, House on the Hill is a self-catering stone cottage situated on the hill adjacent to the Marble Campsite. Conservancy Safaris – Namibia (CS-N) enables the discerning traveller to Namibia to make a real difference by improving the future of five remote communities which collectively own the local company and which receive all profits. Thus the CS-N is helping to ensure a future for wildlife in some of the most spectacular landscapes in the world. Nearly 2 000 Himba and Herero people in the far north-western Kunene Region benefit from these operations through their membership of five conservancies – Marienfluss, Orupembe, Santitatas, Okonjombo and Puros. A further jewel in the crown is Etambura Camp. Co-owned by CS-N and the Orupembe Conservancy and set on a hilltop with magnificent 360-degree views, the camp has five tented units, each with its own en-suite bathroom and private deck area. In Namibia, as in other countries, the tradition of adorning the body goes back thousands of years. 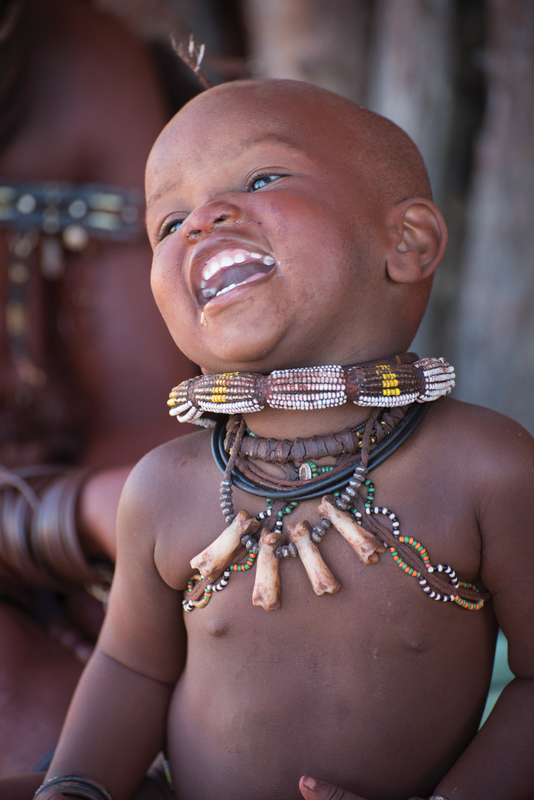 Today it is primarily the Himba who still adorn themselves with traditional jewellery. Both men and women wear large numbers of necklaces and arm and leg bracelets made from ostrich eggshell beads, grass, cloth and copper. Iron-oxide powder with its shiny effect is worn like western glitter, while ochre mixed with fat is rubbed into the skin to give it a warm terracotta glow. The large white shell worn on the breast by Himba (as well as Owambo and Herero) women is called the ohumba. When travelling through Namibia’s rural Kunene Region, an especially visible form of folk art is the hand-carved makalani palm nut, referred to as vegetable ivory. Carvers transform the kernel into distinctive and decorative buttons, which are sold as simple ornaments or featured in formal and informal jewellery, and in functional items such as key rings and bottle openers. The carved nuts usually depict animals – elephant, rhino, giraffe, gemsbok and springbok – or topical themes such as the Namibian flag and domestic scenes.